and that’s how i bought six johnny depp movies. so the love of my life has left oshkosh. that’s right. Johnny Depp (aka, the future Mr. Crystal Lindell) officially left the Sawdust City Friday. and i got to wait for him to get on his super cool private jet at Basler Airport so i could tell my paper EXACTLY when he left town and we could write it in an article. and then it was like 10:30 p.m. and by that time and i NEEDED a depp fix, so i went to the 24-hour wal-mart and bought pirates of the caribbean 3.
and fyi, that movie is NOT worth $19.99. and then the next day i went to the local movie store downtown and was SO impressed that they were smart enough to have a whole Johnny Depp display that i bought Finding Neverland, Ed Wood and Blow. 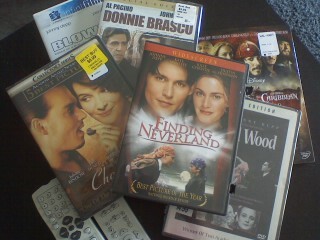 and then on Sunday I went to best buy and bought Chocolat and Donnie Brasco. anyone want to watch a movie? you still rock. i want more on the movie splurge, but i know that’s because i’m a movie freak. anyway, keep up the great posts. I agree with you on the third Pirates movie. After watching it, I was glad I used the library to get my hands on it instead of buying, which is what I was originally planning on doing. Well, I thought Donnie Brasco was a good movie anyway. I'm going to Six Flags .